The phrases “remote work,” “distributed teams,” and “digital nomad” are becoming more and more trendy on the Internet. A lot of companies and virtual employees (us included) are writing about why it’s so great to be able to work from across the world and on your own schedule. Basically, there are a lot of benefits of working remotely for both employers and employees. Personally, I’m all for it. I’m writing this article from a beach in Palawan, the Philippines with a healthy layer of sunscreen. Remote work is interesting, and it’s exciting, which means people are more likely to read about it and publicly endorse it. But there’s another side of the coin. There are companies for whom distributed teams didn’t work out. StatusPage.io wrote a blog post on their failed attempt to build a remote team and there’s a topic on Quora all about Problems Working Remotely. There’s this heated argument against full-time remote workers that stemmed from an article called Don’t Hire Remote Workers. Since remote work is such a new trend, there are plenty arguments for it and not as many arguments against it from companies who have tried and failed. This article is my attempt to dig out the most common concerns that agency owners, project managers, startup CEOs and business founders have about hiring remote workers, as well as the biggest disadvantages of working from home. I started my research by scouring the Internet for existing articles. There are some excellent opinions out there on the disadvantages of working from home, but most of the responses I got were from online communities. I asked questions on r/digitalnomad (to get the remote worker perspective) and r/startups (to get the business owner perspective) on disadvantages of working from home. I also posed the question in communities on Quora, Inbound.org, GrowthHackers, The Workplace, and found an existing thread on HackerNews. Working independently with just a computer screen to keep you company is vastly different from the hustle and bustle of an office. When you hire remote workers, you can’t just pull them into a quick meeting (which some would argue is a good thing, since meetings waste time), or stop by their desks to see how work is going. There’s going to be some loss in camaraderie since you won’t see your team face-to-face every day. Not only is the lack of work culture a concern, there may be cultural barriers if you’re hiring a remote worker from another country. In some cultures, employees are expected to agree with everything their employer says. In other countries, different perspectives are encouraged. I can use my own experience as an example for this. When I worked with a marketing agency in America, I was encouraged to voice my opinions, even if they went against our founder. When I consulted with businesses in the Philippines, a common complaint was about employees always saying “yes” to whatever their managers want (even if they couldn’t deliver). Unique expectations arise with workers from different countries, ranging from standards for employee behavior to communication preferences. Try to get together in person at least once a year. Jay Baer of Convince and Convert brings his team together annually for a strategic planning meeting. They spend two days working and two days hanging out and getting to know each other. Zapier brings their distributed team together for regular team retreats where cooking, games, and lots of other team-building activities are involved. Equip your team with knowledge of the basic aims and foundations of your company. Make sure everyone is familiar with the company values enough so that if they need to make an urgent, educated guess, they’re likely to make the right one for the business. For example, do you lean toward transparency or discretion? Do you prioritize action or caution? Provide and nurture an online meeting place. Automattic, the team behind WordPress, developed an internal blog called P2 where everyone can publish posts based on their achievements and how their week went. At Hubstaff, we have a Slack channel for random discussions where we discuss 30-day running challenges (which I supported with good thoughts) and share interesting articles we find around the web. Communication on a distributed team is a whole other ballgame. I never realized how much I took co-located colleagues for granted until there was no one beside me I could ask a quick question. Every question, every answer, every approval will be documented on a remote team. This makes for great records, but bulky loads of information to sort through. Remote workers must balance various, almost overwhelming communication streams. There are instant messaging apps, video call software, project management tools, and of course the ever-present email. With so many channels to check, it makes sense that managers are worried about information slipping through the cracks. Have virtual meetings, even with co-located staff members. There are multiple benefits to this, one of which being you can record the entire meeting for later reference. Eliminate email (almost). Hubstaff takes a stronger view on this, with our team avoiding most email like the plague. However, I’ve found that the occasional email is sometimes necessary. Lean towards project management tools like Basecamp and Redbooth, which allow you to keep track of what everyone says in one place. Most PM software also allows you to organize projects and store files, create checklists, and assign due dates for clear expectations. Invest in communication structures. Despite added expenses of PM fees, software, virtual insurance, VPNs, etc., companies can stand to save a lot on the overhead costs of running an office. No rentals, no electricity bills, and no more perpetually purchasing office supplies. Use those savings to invest in online communication ecosystems. Teleport has a few great blog posts for communication in remote teams. Reliability is a problem for some co-located teams, but when you remove the manager’s presence things can turn catastrophic. What happens when you pay a remote worker a retainer and they never send you the work? How do you know your remote worker actually wrote that blog post instead of plagiarizing it off the Internet? And even after you’ve taken the time to train remote workers so they are awesome, integral members of your team, what happens if they just stop answering your emails and disappear without a trace? Get your hiring right. Remote work is a skill you should be looking for in resumes by checking out past experience. Look for people who have done it before, or have run their own businesses. These are great indicators of initiative and independence. Check out this infographic for tips on interviewing remote workers. Document processes. Keep detailed records of how something is done so that even if your only marketing person leaves, you’ll be able to train another hire with the process documents and videos. Aim to make these the same level of quality as online tutorials, and keep everything easily accessible and navigable online. Use content checking software to ensure the work you’re paying for isn’t stolen from somewhere else. It’s quick and easy, and will alert you to any red flags on your team. Consider non-monetary benefits for getting your remote workers to stay. For example, some companies will provide a monthly budget for the gym or exercise, and others sponsor vacations and trips. The most obvious reasons distributed teams differ from co-located teams is because you cannot watch a distributed team in one physical space. That means all of the standard measures of management and performance, such as time in and out, go out the window. Many strategies that worked for managers in the past will be impossible with a remote team. No more getting the team together after lunch for a project post-mortem, no more doing walkarounds to make sure everyone is working, and no more being able to visit someone’s desk and demand their attention. Remote work could make much of traditional management practices useless. In addition to being difficult to manage, it can be hard to keep remote workers accountable. With a completely virtual presence, it’s harder to establish ties, such as friendship and camaraderie, that encourage accountability. Provide a time tracking tool for remote workers to monitor their billable hours. This is also good to make sure your remote team members don’t get burnt out working overtime. Managers should be able to view this time data and see which projects their team members are working on in real time. 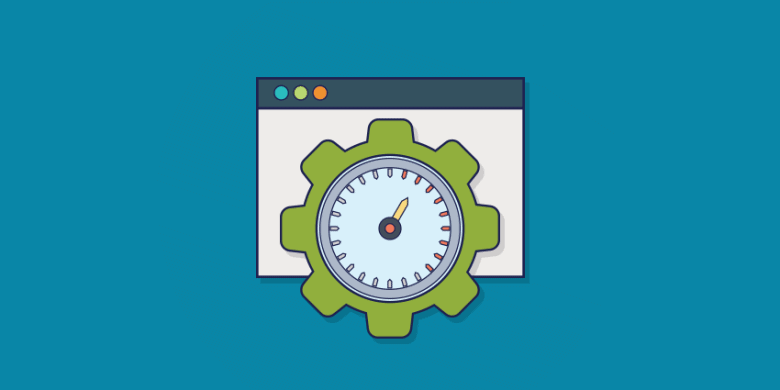 At Hubstaff, we use our own software, which supports randomized screenshots, app tracking, URL monitoring, productivity gauges, and detailed time reports. It also provides a breakdown of where someone has spent their time on an organization, project, and task level. Read up on remote working ebooks to learn about best practices for managing remote teams, and study how successful virtual companies achieved their well-performing teams. Have a culture of transparency. This allows everyone to get a good grasp of each other’s tasks and responsibilities, which encourages good expectations accountability. It could be as simple as sending a weekly report to a shared channel, or keeping all of the projects in your PM tool viewable for all employees, so they can see what’s going on within the company. If you want to take it a step further, consider revenue transparency or public salaries. 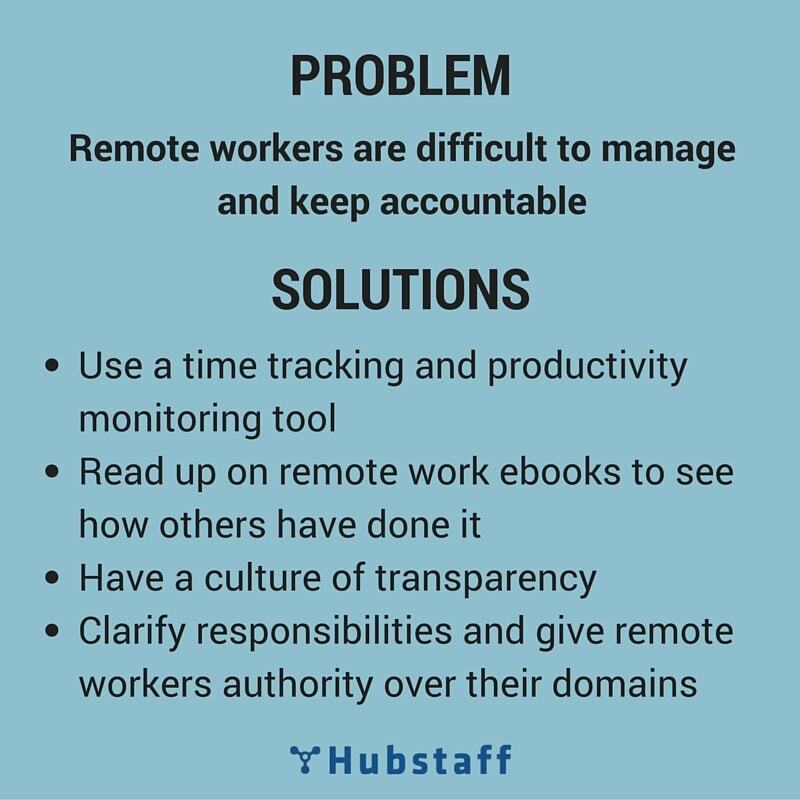 Give each of your remote workers a domain of authority and set clear responsibilities. Being accountable for self-contained tasks means they will be able to work with fewer interactions and more independently, and there is no room for uncertainty about what is expected. Money, money, money. The root of a lot of headaches, from international transfers to confusing tax laws. Paying an international team is much more difficult than giving out checks or setting up direct deposit with a co-located team. You have to worry about how to send it, fees, the conversion rates of the day, and much more. What tax forms are you responsible for? How do you file benefits for international employees? A business may almost want to hire a person just to take care of processing payments for remote workers. Then, there’re the time zones. It’s hard enough to keep track of the time in one location, so what will happen when you suddenly have to keep track of multiple time zones? What does it mean for scheduling? Don’t even get me started on deadline misinterpretation. Get a tax filing service or software to ensure you’re following all the tax laws across borders and states. TurboTax and Quickbooks are some of the leaders in this space. 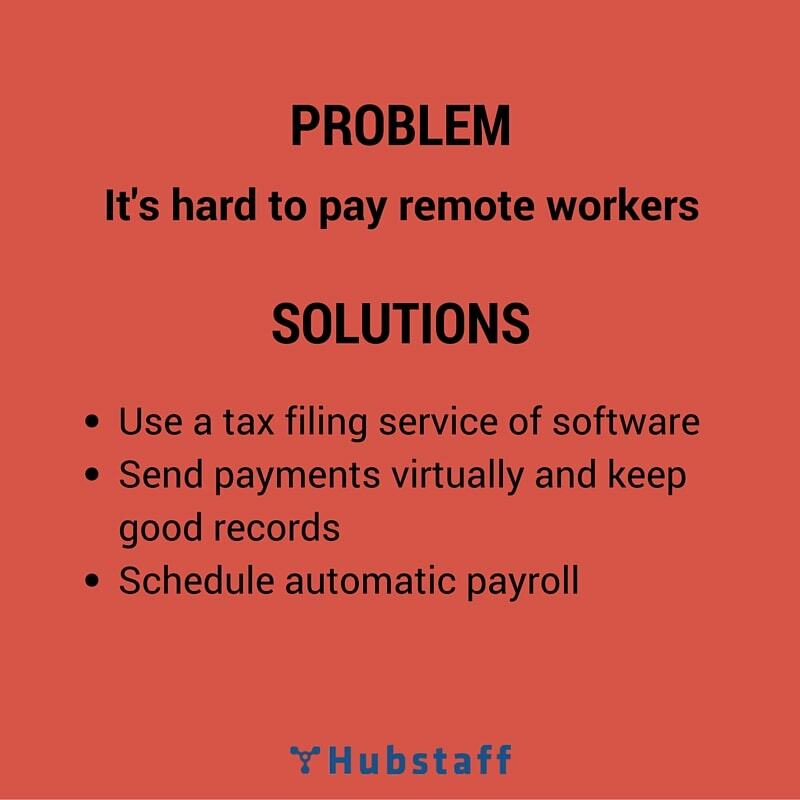 Hubstaff has an independent contractor payment system that saves us quite a bit of time and money. We use an integration between PayPal and our software to send out automatic payroll every two weeks to all of our team members around the world. Use time zones to your advantage. Timezones are a great and terrible thing. On one hand, I know what it’s like to wake up at 6 a.m. for a meeting. Or sleep at 3 a.m. waiting for an update from the team. I’ve also seen the benefits of having a person online at all times for our customers. This is especially powerful in customer support. It allows for 24/7 support with just a few strategically placed (literally) people. Time.is is a great way to compare what time it is (and will be) in other places and can help you keep track of the time where your other team members are. And don’t fret, because you’ll get the hang of it. I often forget what time it is where I am. But after working on a remote team for 3 years, I’ve learned how to do timezone calculations almost subconsciously. Just be sure to set an alarm for Daylight Savings. “Working from home or a hotel: little to no oversight as to what an employee is doing during the day or how distracted they are. Fine for self-starters and responsible folks; not so great for junior and/or unproven teammates. With all the allure of a couch, mid-day naps, Netflix, virtual reality games, drum lessons, airline flight sale alerts, and whatever small distractions there are in a day, it’s no surprise that managers worry about work productivity for their employees out of the office. They are at the mercy of beckoning chores. A full pantry of things to snack on. “Quick” walks to the park, and so much more that can distract them from work. I can see how easy it would be for tasks to take longer. For example, a task that would take one hour in an office could take five hours with distractions. 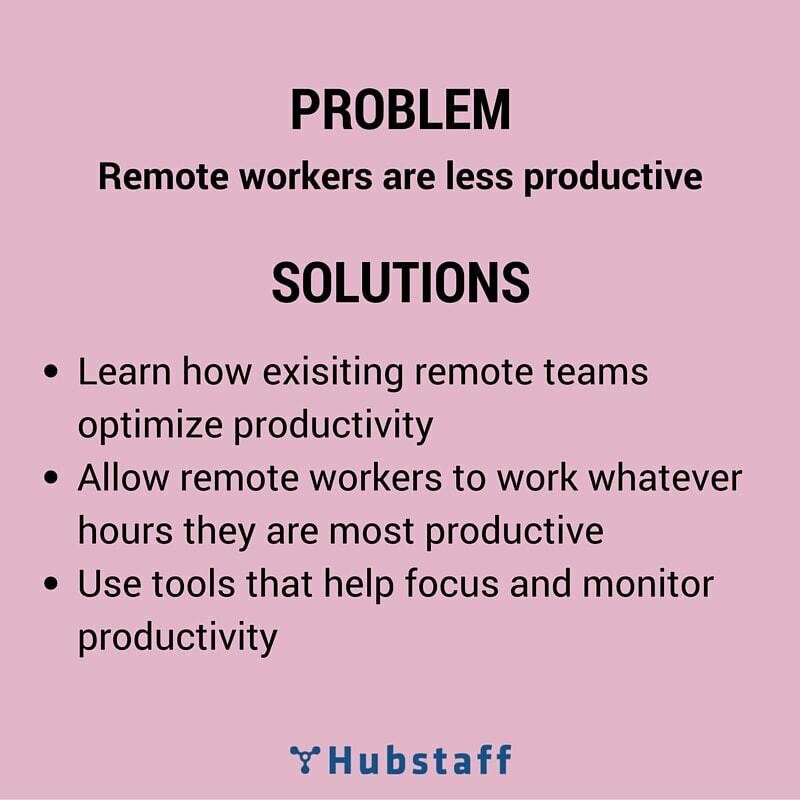 This is such a big concern that there is a slew of articles on improving productivity for remote teams. Check out how the members of our team structure their work day and their tips for working from home on our blog. Use tools to keep your team productive, like Google Drive to sync everything (I’m writing this section of the blog post on my phone using Google Docs while I wait for a delayed flight), ColdTurkey to block out distracting websites, and Coffitivity to provide some ambient noise. Hire go-getters and let them loose. Often, they will surprise you. If you need more proof, just check the Activity Levels on Hubstaff. You’ll be able to see which of your employees is most active while tracking billable hours. Reward your top performers and re-evaluate the others. For remote workers and businesses who may employ them, the loss of a laptop is catastrophic. Other causes of worry are data leaks and employees stealing data. Data theft by employees, both remote and co-located, may be more common than you think. The fact is storing data and transferring money online exposes you to potential vulnerabilities. So, worrying about your data security is a good reason to want to stick to co-located offices. Use a password manager like LastPass or Dashlane. Password managers make it so that your team members only need one password to access all the accounts they need. Each account can have a different password to keep them secure. So even if a team member leaves, you only need to change a single password to secure your accounts. To protect your data, even against remote employees who may leave the company, install encryption software and remote-wipe apps so you can delete your data if the device is lost or your remote worker goes MIA. 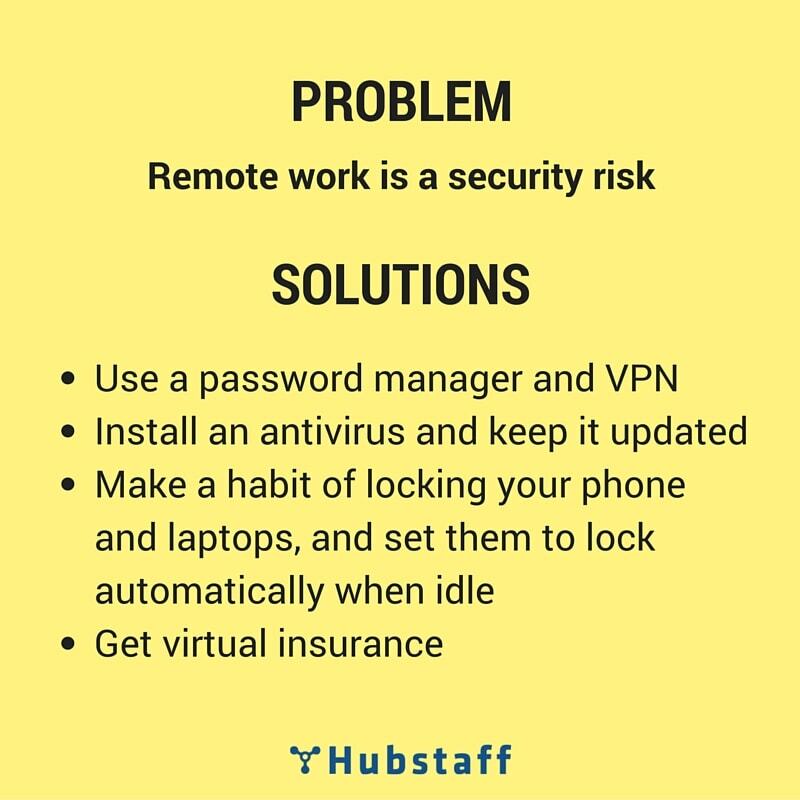 Please note that you should only do this if you provided or paid for the device that your remote workers are using. Invest in VPNs. Virtual private networks encrypt your data and provide secure access to a remote computer over the Internet. It basically extends a private network over a public one, such as the Internet. These are excellent for keeping your files and data secure, yet accessible to remote workers. I use Browsec right now, but there are plenty of others. Keep your antivirus updated, and only install one. Although installing multiple antivirus software may seem safer than just having one, they may interfere with each other. Stick to one good provider, keep the software updated, and run daily scans. It also helps to turn browsing protection on. I’ve been using AVG since 2008 and it’s worked like a charm. Lock your phone and laptop. Make sure no one is able to access your devices without a password or fingerprint scan. Set your laptop to automatically lock if not in use for 5 minutes or more. This will keep your data safe. Google also provides a great phone tracking service. Just type “Where’s my phone?” In the Google search bar, or check out the Android Device Manager. There are also apps that take photos of whoever tries to unlock your phone or laptop with an incorrect password, such as GotYa! and Lockwatch. If you want to take things a step further, you can also invest in digital insurance. I received many other concerns that deserve a spot here. However, I’d like to touch on two that didn’t quite fit into the 7 big problems. One is the jealousy aspect. I’ve been in semi-remote teams wherein only a few people (or even just me) were allowed to work from home. What has worked for me in the past is to clarify responsibilities between my manager and colleagues. Then deliver unfailingly. Once a team learns to appreciate your work, it shouldn’t matter whether you do it beside them or from somewhere else. Another concern is the care that goes into a business. I’ve seen remote workers who were just as dedicated to their companies as local employees. I’ve seen in-office employees waste as much time as possible because they simply didn’t care about the business. The relationship between a manager and employee can affect how the employee sees the company as a whole. So in order to increase loyalty, remote team managers should be advocates and someone remote workers can trust. 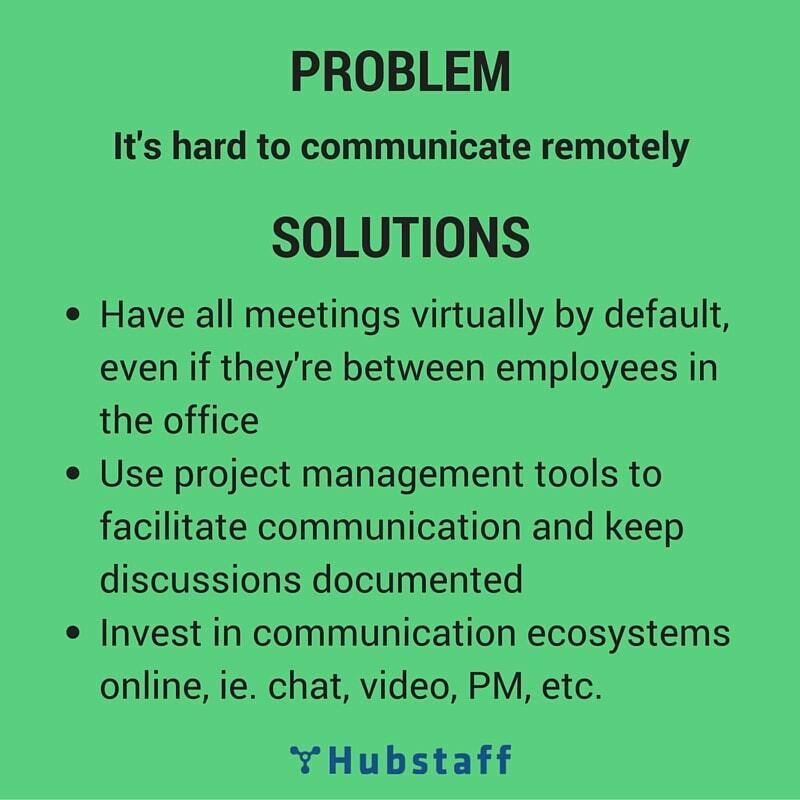 A lot of businesses, employees, contractors, and freelancers seem to be either all for remote teams or completely against it. While remote work is an excellent way to work, it isn’t for everyone. There are plenty of understandable disadvantages of working from home. But they don’t necessarily overshadow the disadvantages of co-located teams, either. One option is to look at remote work as a benefit, not a policy. In today’s (and tomorrow’s) economy, there are going to be vast opportunities both online and locally. Opening or closing the door on remote work and distributed teams can be a great decision if it aligns with your strategy, goals, and what you’re trying to accomplish. Also, that decision doesn’t have to be final. Co-located teams can successfully go remote, and teams that started out remotely can decide to get an office space. Remote work is going to continue to evolve, but it isn’t going to go away. Whether or not it’s for you and your agency is a question with a fluid answer. To sum it up, there are a lot of valid reasons managers and agencies shy away from remote workers. It’s hard to blame them. However, for those who want to give a distributed team a shot, there are avenues and tools for you to try. I encourage anyone on the fence about remote work to try it out by starting small. Hire a freelancer or independent contractor, or give your team one or two days a week to work remotely. See how it goes (and share in the comments). I’d like to thank everyone who contributed their concerns about hiring remote, and disadvantages of working from home. Shout out to the communities on Growth Hackers, Inbound.org, Quora, and Reddit for answering my questions. Rachel is a content strategist, SEO writer, and inbound marketer. She loves writing about remote work, productivity, and workplace culture. Rachel works remotely from around Asia, and is continuously learning about content strategy, SEO, and WordPress. Connect with her on Twitter @rgo_go. Atlassian’s well-known project management tool contains a host of features that make managing projects a breeze. It was originally created for developers but has now grown into a fantastic company-wide organization tool. If you’re new to JIRA, or just want to see what it’s capable of, it can be intimidating. This JIRA for beginners guide will show you what software can do, how to get started, and how you can make the most of this phenomenal project management software.